The Rodent Blox forms include Contrac Blox, Fastrac Blox , Final blox , and Terad3 Blox. 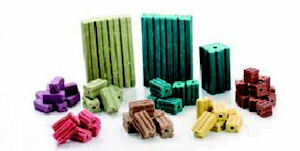 These extruded blox forms are the most used and popular choice of all the forms. Blox forms may be used inside or outside. They are weatherable and hold up well outside. Multiple gnawing edges. Rodents like to gnaw. Come with a center hole for securing rods in tamper-resistant bait stations.